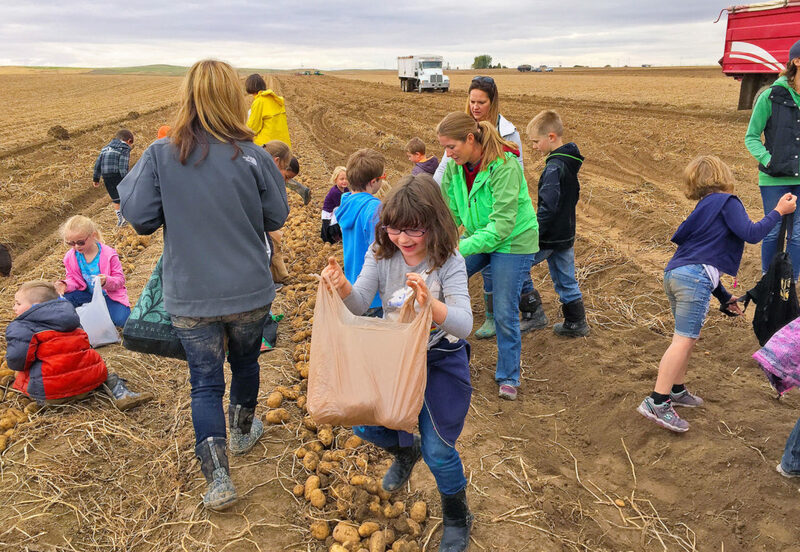 ABERDEEN — Grinning Pocatello Community Charter School first- and second-graders tromped through a muddy field Thursday morning lugging grocery sacks overfilled with hefty Russet Burbank potatoes. Their field trip to Gehring Farms in Aberdeen, where they toured potato harvest and then gleaned potatoes, doubled as a service project — one they tackled with a zeal befitting an Easter egg hunt. They filled the bed of a pickup truck with nearly 2,000 pounds of spuds, planning to donate their bounty to the Idaho Foodbank in Pocatello. “We believe strongly in service learning opportunities, so we’ll walk to the food bank and learn about the services the food bank provides to our community, and then the kids feel this responsibility to help others in the community, and they make connections between their role in the bigger Pocatello community,” said Charter School teacher Whitney Griggs.